Following the most anticlimactic crash in the world, Gemma has a small scrape on her arm and Matt is not amused at her - she‘s damaged Bella and paintwork like hers isn‘t easy to touch up. On top of the damage to his car, Dorothy's car has been damaged, and a post box knocked over. They begin to throw around blame - Gemma thinks Matt was going to quickly and Matt says he had no choice but to swerve as she was coming right at him. Dorothy wants to know what the big bang was. She asks if anyone is hurt. CLARRY: No but they will be as soon as you get out there - one of the cars was yours! 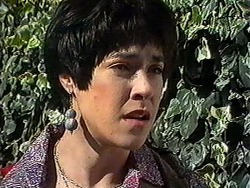 Madge comes running at Gemma's aid as Dorothy comes running to the car's aid. She is very angry at the damage caused and demands to know who is to blame when the blame game starts up again. She remarks she will be riding to school on a bike when Ryan showns her the remnants of her broken bike. Bev arrives asking if anyone is hurt. Clarry: Not yet lady but hang about! 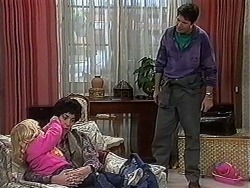 Kerry tells Bev that Joe is still worried about the problems with a home birth. Kerry invites her to dinner, in the hope she will change his mind. Mel is quite a sight as she sits blowing up balloons in a birthday hat. MEL: You can't have a kids party without balloons can we? Matt is adamant that there will be no hats, whistles or balloons! He asks if she has checked everything is good at the coffee shop and she has. MATT: (worried) You're not going to sing are you?! 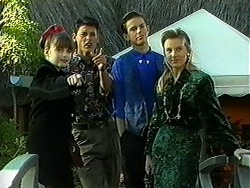 The kids arrive at Dorothy's in an assorted collection of hilariously 90's outfits. Ryan gives them the first question in the treasure hunt. Todd figures out that Kings and Queens, check, religious games are all chess terms so they must have to go to the Bishops. Madge is bandaging up Gemma's arm. 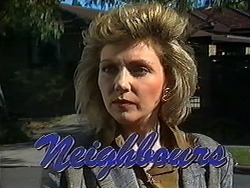 Madge tells her to steer clear of No 30 - Ryan is trouble. Dot is warning Ryan to steer clear of Gemma - she's trouble. All this as she is using a marker to draw arrows on a boiler suit for Ryan. They are walking over the bridge and end up in the Coffee Shop. Matt is dressed in 30's clothes - suspenders, moustache and bow tie. In a ridiculous accent, he sets about giving them a movie-like experience of a 30's diner. 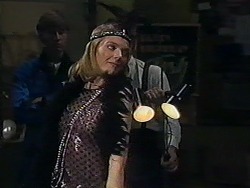 Mel is dressed as a flapper. MATT: (introducing Josh to Mel) This is Josh ‘the punk' Anderson. MEL: Ain't he just the cat's pyjamas!? Bev can't reassure Joe completely about a home birth - she thinks a hospital is best. Kerry is not amused that Bev won't make Joe see her point of view. Matt is serving them ‘prohibition cocktails' which taste suspiciously like fruit juice. MATT: The feds busted out last shipment but we'll have some good stuff in by the time you're 18! Ryan comes in dressed in the arrow covered boiler suit pretending to be a criminal fresh out of prison, also talking in a silly accent. Kerry is not amused about Bev's narrow view on homebirth and cuts to the core. KERRY: You've never had a baby - how could you know what it's like? Melanie is tap-dancing for entertainment which amuses all present. Kerry is holding Sky and ignoring Joe - she is determined to have the baby at home. She won't let him and Bev make her have the baby the way they want - she is having it and she will have it the way she wants. 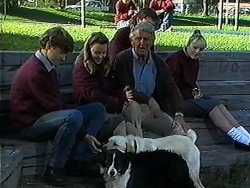 Clarry is chasing Bouncer and Rosie into the playground when Ryan catches them. Dorothy jokes with Clarry that she thought he'd given up education a long time ago. CLARRY: You speak to me like that again girl and I'll put you across my knee. 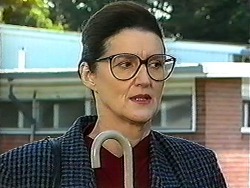 DOROTHY: Don't you dare undermine my authority in front of the students! She is not amused at Gemma's plan to study under a tree - she is only allowed in the common room or library. Bev apologises but continues to try to change Kerry's mind about it. Kerry declares she is going to find a less conservative doctor.